The weather stayed dry but Snetterton lived up to its breezy reputation on the 16/17 June for the third round of the 2012 BHR Championship. Yet another fantastic weekend for Ian Firmin and his ‘Molnar’ Manx with wins in all the races he contested and to cap it all, the fastest lap of the day at 82.22 mph. Tim Woolley on his Rob North Rocket 3 saw off Roy Robertson to win the first leg of Event 5B and he repeated his success in the second and third legs. Whilst event 5A saw the first of the weekend’s wins for Ian Firmin – and he dominated the second and third legs with a lap of 81.49 mph in the second. Guy Topper dominated the weekend’s scooter races beginning with race 2, continuing with races 10, 18 and 24. The first outing for the BEARS saw the Laverda of Rob Lawton in front of Ben Kingham’s BMW K100. In the second leg Rob was challenged strongly by the BMW but held on to win this race and race 19 – the first of Sunday’s BEARS outing – was a BMW benefit with Ron Maul on ‘Helga’ finishing second to Ben. Rob Lawton came back in the final BEARS race to put his Laverda in front of Ben Kingham. 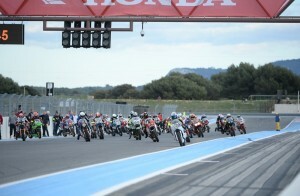 The first outing for the three-wheelers gave a win to Equipe Tuer over the Berkeley of Equipe Ormrod and victory for Julian Bishop over the Triumph of Adam Pope. Nothing changed for their second encounter except that Bill Tuer had a very slim margin over Sid Ormrod at the line. This was reversed in race 20 with the slimmest of winning margins for Sid and they swapped over for race 26 with another very close finish. The final race saw another win for Bill Tuer and an ‘as you were’ for Julian Bishop and Adam Pope. 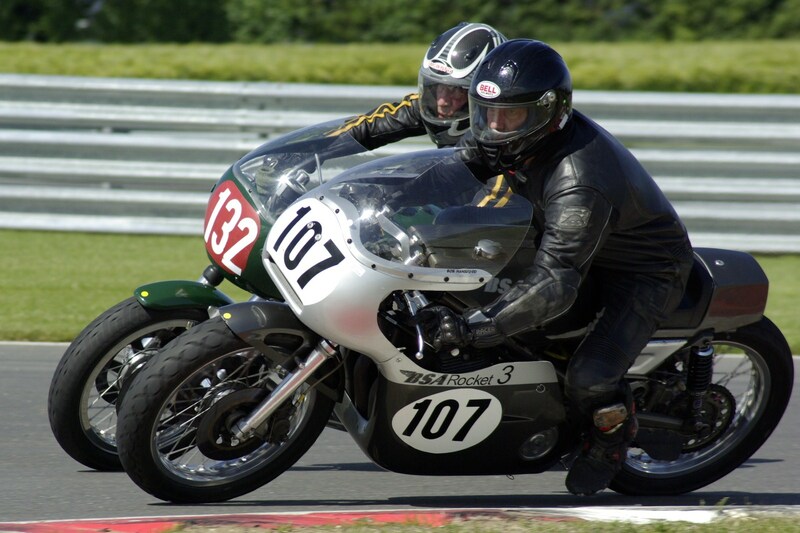 Single cylinder Ducatis and BSA Bantam took to the track together and the Ducati battle saw Simon Morris win all four races. Nick Bramley’s Bantam came home ahead of Mike Powell in the first race but he was just bested by Powell in the second and third outings whilst Ian Scutt came through to win the fourth race from Nick Bramley. Saturday’s race 6 included four events with victories for Clive Ling and his Gold Star in the Goodwin Championship, Andy Molnar on one of his own machines in the Palletforce Championship, Stu Noble and his Ducati in the 250 Specials and Charles Davies on his Ducati Monza in the Economy Appliances race. Davies was challenged strongly in Sunday’s race by Tony Webb. Things remained pretty much in that order in the Sunday races but with Tony Webb in close company with Charles Davies and Richard Molnar shadowing Jack Scrivener to the line in their respective races. The “Sidecar-based three-wheelers” came out to play and it was first blood to Phil Biggadyke over Equipe Weston but the tables were turned in races 15 and 29 with Equipe Weston taking the chequered flag. However Phil Biggadyke got his revenge in the final sidecar race of the weekend. Chris Firmin put in a lap of 81 mph to clinch race 8 from Jack Hebb and confirmed his dominance with a lap at 82 mph to win race 30 from Austen Kear. 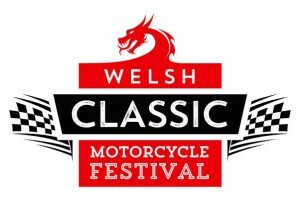 Whilst Clive Ling continued with his winning ways in the Bob Newby Racing Championship and Ian Cramp held off the remarkable Norton ES2 of Simon Clover in race 16 and the Vincent Comet of Ben Kingham in race 30. Just to show that it was not a fluke, Chris put in an 82.22 mph lap to clinch the final ‘big race’ of the weekend with a win over Jack Hebb. The Bonhams “Over 50’s” race was a comfortable win for Tim Woolley on his Rob North Rocket 3 over the Egli Vincent of Roy Robertson. 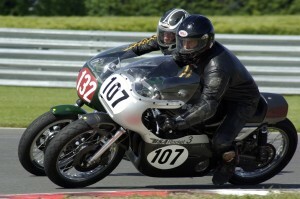 The muscular Vincent outfit of Julian Bishop claimed the ‘”over 50’s sidecar race.